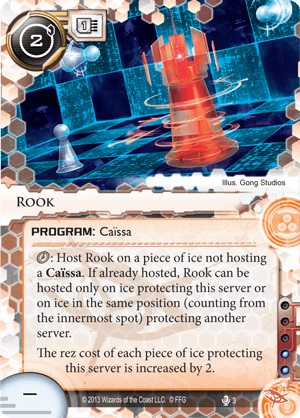 click: Host Rook on a piece of ice not hosting a Caïssa. If already hosted, Rook can be hosted only on ice protecting this server or on ice in the same position (counting from the innermost spot) protecting another server. Rook is the 2nd in a series of Caïssa programs. Hat tip to Fantasy Flight Games for the cool name as Caïssa is the name of a fictional Thracian dryad portrayed as the goddess of chess. Thematically all Caïssa programs once installed onto ice may move around the servers with unique movement restriction rules similar to chess pieces moving on a chessboard. Currently only four Caïssa programs have been released, Pawn, Rook, Knight & Bishop. Deep Red is the console specifically tailored to complement Caïssa programs by providing dedicated memory as well as allowing the unlimited positioning for only one . This ensures you can get Rook onto the specific ice you need it on frustrating the corp with slightly higher rez cost. Pawn can save the runner some credit and click savings when used to run on a preferably lightly guarded server where in addition to accessing whatever is in that server the runner may then install a Caïssa program like Rook for free. Additionally sometimes a corp being harassed by Rook may choose to trash the ice hosting it, Pawn can then be used to bring Rook right back onto another piece of ice. Can make some cheap ice such as Pop-up Window or Data Mine much less desirable to rez. Costs 2 to install. Even if it was 0 like Pawn, it seems doubtful this card would seem much usage. Payload for Rook results only increasing the rez cost of ice by 2 , costs the same as Knight where you actually get an AI ice breaker. Until King or Queen are released, probably the only main Caïssa program that will see any usage will be Knight. Both Bishop & Rook seem to weak in their payloads given their costs. Perhaps future Caïssa program, hardware resources or even perhaps events will change things, until then probably not much appeal here.